The door opens and Watts is met with a group of grins as he hands each person packages of food. 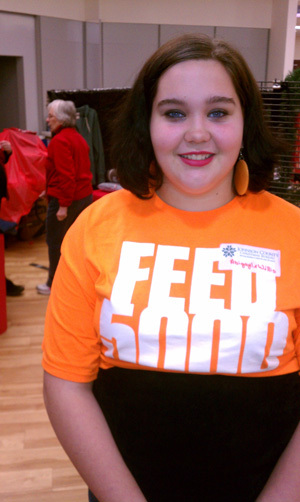 Watts is one of the volunteers with the Feed 5,000 program at Merriam Christian Church (Disciples of Christ) at Johnson Drive and Interstate 35. Harvesters, a community food bank, supplies backpacks for needy children that they take home on Fridays during the school year to make sure they have food over the weekend. Then, two years ago, the Merriam Church started buying food and putting together packets throughout the summer, said the Rev. Mark Willis, pastor. Since most of the people served don’t have transportation, church volunteers deliver the food. And they do a lot more. Other area churches are deeply involved in community service, but Merriam Christian has quite a story. By most standards it would be considered a small, aging congregation. The average age is 70, and the average Sunday worship attendance is from 80 to 100. The congregation decided last year they wanted to feed 5,000 people. Instead, to the amazement of Willis, they fed 16,944. “I was definitely inspired by how much all of our folks found a way to participate, regardless of physical limitations,” Willis said. Members came up with all kinds of ways to get it done, he said. Computer-savvy members found websites where they could donate to feed the needy in this country and overseas. One homebound member had her in-home helper buy extra food, and someone from the church would swing by and pick it up. Willis said members needed to focus on how they could be what Christ called them to be. 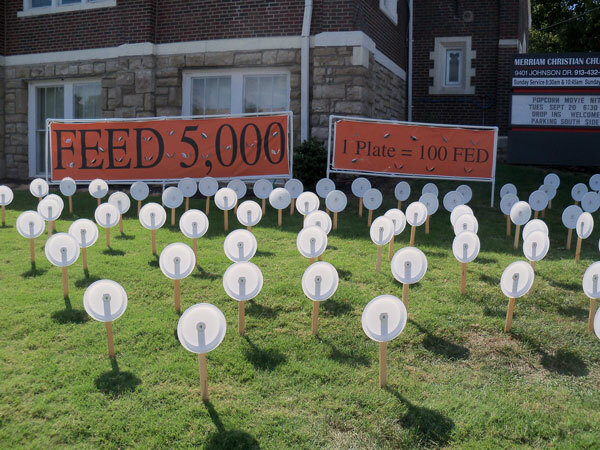 That’s when the congregation last year made the pledge to feed 5,000. It was linked to Matthew 14 and the story of Jesus feeding the 5,000. “We feel this is what God intends us to do,” said Carole Prentice, leader of the church’s outreach ministries. The one rule is that it had to be outreach ministries; pot-luck dinners and meals for church members didn’t count. The church already had developed a partnership with Merriam Park Elementary School, and in 2010 had helped with the backpack program. The church also is involved with Meals on Wheels, collecting food for local pantries and cooking and serving meals quarterly for the Johnson County Food Ministry. And they pack the backpacks with food from Harvesters and take them to the school. The first year, a 90-year-old woman from the church made it her personal project to put the packs together each week, Prentice said. She’d sit down, go at her own speed and the job got done. “I have no problem getting volunteers,” Prentice said. Last year was the second time they took on supplying the packs for the school’s needy students during the summer, and they expanded the program to include food for the whole family. They also put together Thanksgiving baskets, and adopted 17 families for Christmas, supplying them with gifts, clothing and food for their Christmas dinner, Prentice said. And he said it gives hope to the people they help. “It makes them feel that they are not alone,” he said. Well after the 5,000 goal was passed, members kept coming up with ideas. One was the Kindness Bus. Volunteers rode around town and passed out grocery cards. They gave out pizzas, bought lunches for volunteers at an animal shelter, passed out gift cards for free lunches, bought food for families and paid delinquent hot lunch accounts at an elementary school. This year the church is still at it, but Willis said he is putting the focus on individual members of the congregation, asking them whom they have fed today. And the goal is not just to feed people physically but spiritually as well. Willis said the lesson is: “Regardless of the size of the congregation or the age of the members, we can all do what we’re gifted at. God has given everyone gifts.